Ray Fränkel started his football career at Transvaal in Surinam. Soon he made the move to the Netherlands and started in the Feyenoord youth academy. After failing to break into the Feyenoord first team, Fränkel moved to Estonia. He played during their 2002 season at FC Flora. He returned from abroad in the season 2002-03 when he signed for FC Groningen. In 2007 Fränkel returned abroad again. He signed a 2-year contract at Belgian club Royal Antwerp FC at the Bosuil until 2009. His successful stay was extended with another year but then expired in June 2010. Frankel returned home by signing a contract at the Topklasse club FC Lisse. In the second half of the 2010-11 season, he terminated his contract to continue his career abroad. It is said that he signed for Qatarese club Al-Shahaniya. Currently Frankel is playing for SV Transvaal, one of the big clubs in Suriname. 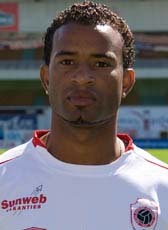 Ray played international games for Suriname. Ray is a cousin of fellow professional football player Purrel Fränkel.